Our team takes part in the 19th China International Agrochemical & Crop Protection Exhibition (CAC 2018) in Shanghai. 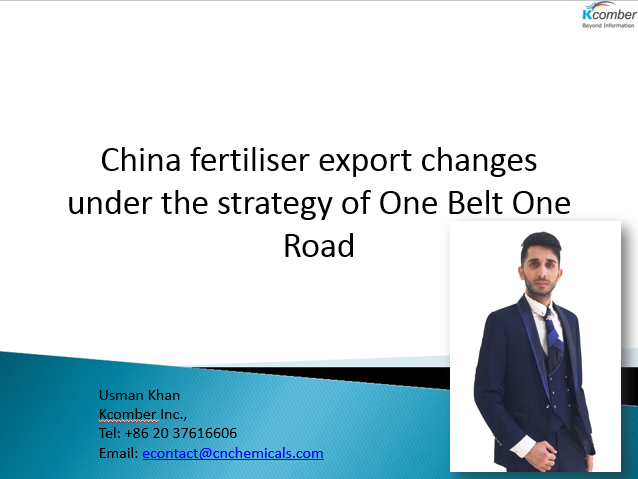 Known to be one of the research and opinion leaders of the Chinese agrochemicals market, Kcomber’s General Manager Usman Khan has given a presentation on the first day at the 9th China International Fertiliser Show (FSHOW 2018), that comes together with the CAC. In the speech, he outlined the development of China’s fertiliser industry to the crème a la crème of China’s fertiliser leaders and gave recommendations of how to deal with the development. Mr Khan started the presentation with an overview of China’s fertiliser industry from 2015-2017. 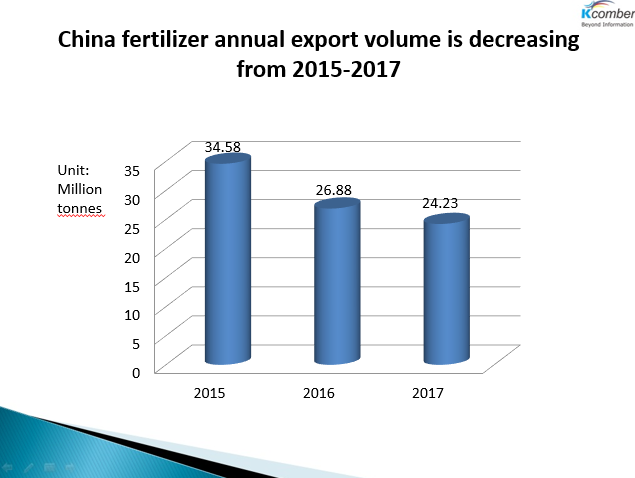 During this period, the market saw year-by-year falls in fertilisers export volume from China. According to Mr Khan, there are several reasons for the development. First of all, the domestic supply and demand situation. Large quantities of obsolete production capacities were phased out for the supply-side structural reform carried out by the Chinese government. Preferential policies for fertiliser production were removed and the demand fell stably, due to the Proposal to Take Actions to Achieve Zero Growth in Fertiliser Use by 2020 unveiled by the Ministry of Agriculture of the People’s Republic of China. Lastly, production cost was increased because of the inspection for environmental protection mainly. The trade structure is another reason. China mainly exported basic fertilisers such as urea and phosphate fertiliser, which were disadvantaged for their high cost and poor competitiveness. By contrast, the urea business in the USA developed vigorously, based on the large-scale production of shale gas. From 2016-2017, a total production capacity of 3.70 million t/a was constructed in the USA, and the figure will rise further by 360,000 t/a in 2018. The USA may change its role, from a large urea importer to an exporter, according to Mr Khan’s insights. In addition, OCP Group exploited its advantages in phosphorus resources to the full and expanded its production capacity. In 2018, another 800,000 t/a phosphoric acid production line is to run, and its production capacity of granular phosphate fertiliser will surpass 12 million t/a. The significant expansion in fertiliser production capacity and the fiercer international competition are increasing threats to China’s traditional fertiliser business. Under such circumstances, domestic fertiliser makers are expected to go abroad, so as to give full play to both domestic and foreign markets, is the result of Mr Khan. As the next topic, he spoke about the role of the Belt and Road project in the fertiliser industry. South Asian and Southeast Asian countries along the Belt and Road are targets in particular. Their agriculture businesses, which demand many agricultural means of production (AMP) such as fertiliser, still play a vital role in their national economies. Their fertiliser outputs are low, restricted by the economic conditions, production facility and technology and soil management. Specifically, they import large quantities of nitrogenous fertiliser, phosphate and compound fertilisers and potash fertiliser. Hence, they are the first choices to the domestic fertiliser business. 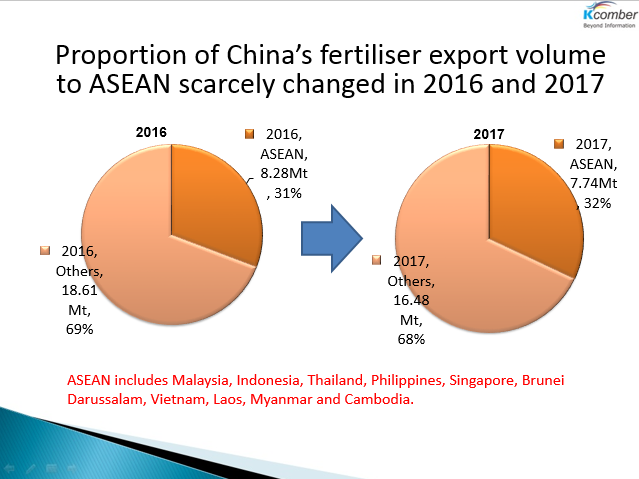 According to China Customs, China’s exports of fertilisers to the countries under the Association of Southeast Asian Nations increased in 2016 and maintained stability in 2017, despite falls in the national totals. It is of great significance to export the domestic advanced fertiliser and pesticide production facilities, production technologies and quality products to the countries along “B&R” (strong demand, short shipment distance and low shipping cost, if the domestic AMP suppliers intend to achieve internationalised development. According to Mr Khan, the domestic fertiliser business is not aimed at earning foreign exchanges through exports but instead is to guarantee the domestic agricultural production, especially to ensure the long-run and sustainable production of grains. In 2017, the Chinese administration issued the “zero tariffs” policy on part of the fertilisers, a move intended to get the business out of trouble. This policy will continue in 2018, so as to manage the conflict brought by the full-year production and the seasonal demand. Furthermore, the export of fertilisers is mainly to protect the business and the production capacity, he explained next. For one thing, idle production lines may run and the economic effect may be achieved when it is the off-season. Such a continuous production will enable enterprises to reduce costs and better solve problems in environmental protection and safety. For another, if an enterprise has relative overcapacity, it is capable of flexible supplies. This will contribute to better protection of domestic agricultural production. The export of compound fertilisers is very different from the export of either urea or phosphate fertiliser, as compound fertilisers are of high added-value. This business will export technology, services, talents and even brand image, in addition to product. By contrast, exports of both urea and phosphate fertiliser are only exports of bulk commodity. Under this, the export of compound fertilisers is much more profitable than that of urea and phosphate fertiliser which face homogenization. It is notable that this business must be supported by strong technical teams and agrochemical services and must be tightly connected with local agricultural production abroad. During this, the domestic fertiliser enterprises will build their images in the world and many well recognised multinational enterprises will emerge, like Kingenta Ecological Engineering Group Co., Ltd., Stanley Agriculture Co., Ltd., Shenzhen Batian Ecological Engineering Co., Ltd. and Shandong Hongri Chemical Joint Stock Co., Ltd. The tariff policies which are increasingly favourable for the export of compound fertilisers have been issued in recent years. This also gives impetus to the development of the domestic compound fertiliser business. Compared to developed countries, China-made fertilisers are composited in a relatively low way. However, the development of high-efficiency, labour-saving compound fertilisers has become a trend in the world. It is expected that the favourable policies issued will encourage the domestic enterprises to make greater efforts to develop technologies related and to carry out production, and meanwhile to lead the domestic fertiliser business to make transformation and upgrading. 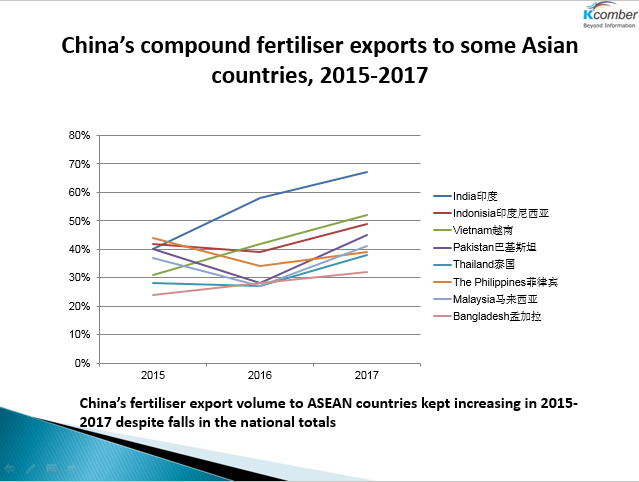 According to China Customs, Mr Khan outlined in front of the audience, compound fertiliser has made up an increasing proportion of the national total exports of fertilisers which have decreased for years. Reportedly, Thailand imports 1 million tonnes of compound fertilisers annually and the average annual growth rate of Vietnam’s compound fertiliser consumption is approximately 5%. Meanwhile, the overall consumption of compound fertiliser is estimated to further increase thanks to the enhanced public awareness of balanced fertiliser usage. Obviously, it plays a decisive role in the domestic fertiliser export business. Hence, it is a key way for the domestic fertiliser enterprises to develop a succession of new products, new technologies and new businesses with a focus on compound fertiliser if they intend to go abroad. According to Mr Khan, Kyrgyzstan-based fertiliser plant with an investment of USD200 million made by Hebei Baidoujia Fertiliser Co., Ltd. is to be constructed soon. It is to produce over 600,000 tonnes of fertilisers such as urea, phosphate fertiliser and compound fertiliser per year. In addition, the company planned to take this opportunity to penetrate into the local seed, pesticides and agricultural machinery businesses and to facilitate the integration of grain deep processing and livestock breeding. Jiangsu Huachang Chemical Co., Ltd. have for consecutive 3 years ranked 1st regarding the exports of compound fertiliser from China. In order to expand the shares in the international market and spread the domestic experience on fertiliser business development, the company has set up a joint venture in Malaysia, which is aimed at promoting formulated fertilisers based on nitrogen, a byproduct from the production of ammonium chloride and ammonium sulphate. Meanwhile, the company has established a team with domestic key players such as Henan Jinshan Chemical Co., Ltd. to make demonstrations and carry out tests and promotions of fertilisers and to share the domestic experience on soil test based formulated fertiliser in the countries and regions along the “B&R”. Hubei Xinyangfeng Fertiliser Co., Ltd. is now selling its products worldwide. In the past 12 years, it has stepped into 30+ countries and regions in Asia, America, Oceania and Africa and its portfolio spanning granular mono-ammonium phosphate, powder mono-ammonium phosphate and nitrogenous and phosphate compound fertilisers, has been marketed widely. Besides, it has acquired Australia-based Kendorwal Farm, a move into the world’s premium agricultural and animal husbandry business. Now the company is clear about its international strategy: that is, to achieve internationalisation of technology, production capacity, trade and resources and to go globalised. Kingenta, as a leading enterprise in the domestic new type fertiliser business, plays a benchmarking role in view of all-round internationalisation. Recent years have witnessed: 1) its acquisitions of and share-participation into many world’s well-known enterprises which are involved in agricultural business, such as Germany based COMPO EXPERT GmbH; 2) its construction of branches in many countries and regions including the US, Australia, India, Spain, Norway, Israel, Germany, the Netherlands, Vietnam and Singapore; 3) its establishment of partnerships with 7 foreign universities such as University of Florida and Norwegian University of Life Sciences and 3 test stations under the United States Department of Agriculture, in addition to its business activities in the domestic 10+ bases. As the conclusion for the presentation, Mr Khan suggested, the domestic fertiliser enterprises should take technology innovation as a fundamental strategy in their sustainable development, pay close attention to development trend of the international fertiliser business, increase the development of new products and new technologies and the transfer of scientific achievements, and strengthen the reform on supply side. All these will help the enterprises establish a technology innovation system combining them with industry, academia and research, build international images and brands, win consumers around the world and gain recognition worldwide. CCM is the leading market intelligence provider for China's agriculture, chemicals, food and feed. Do you want to find out more about the agricultural and agrochemicals market in China? Try our Newsletters and Industrial Reports or join our professional online platform.